A sticky-sweet—and slightly spicy—surprise in the middle of these Jalapeño Jam Corn Muffins is waiting to awaken your taste buds. 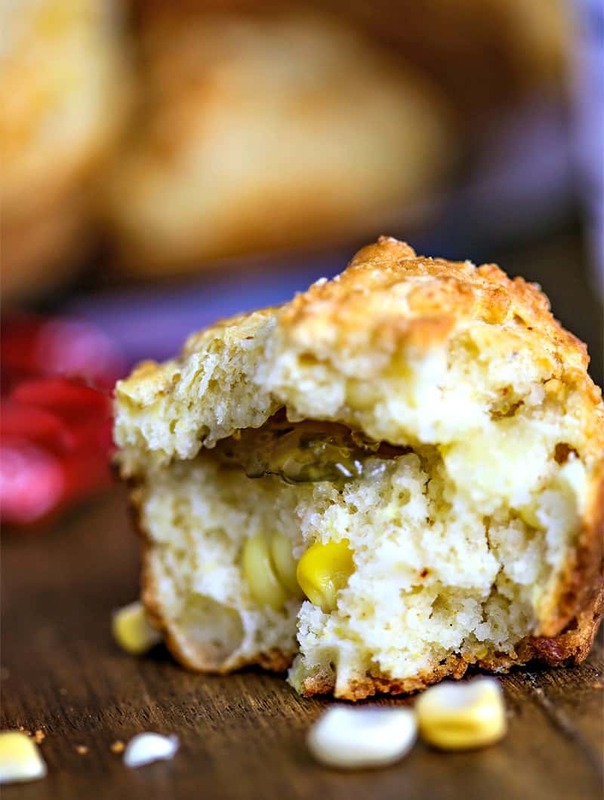 Just one taste and you’ll know this isn’t just any ordinary jalapeño cornbread muffin! 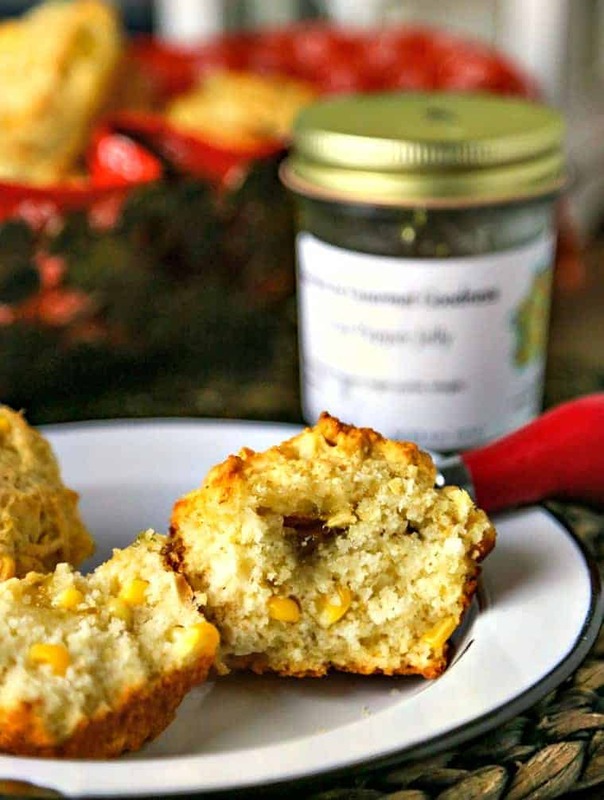 The fresh corn in the batter and homemade hot pepper jelly from the Farmer’s Market practically made this muffin a farm-to-table experience! The batter for these muffins has a cup and a half of fresh cut-off corn, so there’s a taste of sweet corn in every bite. Jalapeño Jam Corn Muffins bake to a golden brown with a nice crispy crust, and until you take a bite, there’s no hint of the surprise in the center! How is it that Summer passed by so quickly?! I know we still have hot and humid days ahead of us here in East Tennessee, but school started back this week and that makes is seem that Summer is officially over (even though we don’t have school age kids in our house!). Even so, John and I are refusing to let go of Summer and are leaving for a quick beach trip tomorrow! We did a big sightseeing vacation in the Mediterranean earlier this year, but this one will be a REAL vacation with rest, relaxation, and hopefully, rejuvenation! All I need for this trip is my swimsuit, my book, my beach hat, and my sunglasses—aahh! It’s officially August and we’re celebrating with Muffin Week! An amazing group of food bloggers and I have teamed up to bring you muffin recipes all week! You’ll find the full spread of savory, sweet, healthy and indulgent muffin recipes over at A Joyfully Mad Kitchen. Be sure to look for some new muffin recipes to try! Let me tell you about the recipe I’m sharing today in collaboration with some other awesome bloggers for Muffin Week 2018. 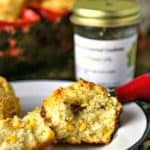 Earlier this week I shared a sweet Banana Chocolate Chunk Muffin and today I’m sharing a savory Jalapeño Jam Corn Muffin. 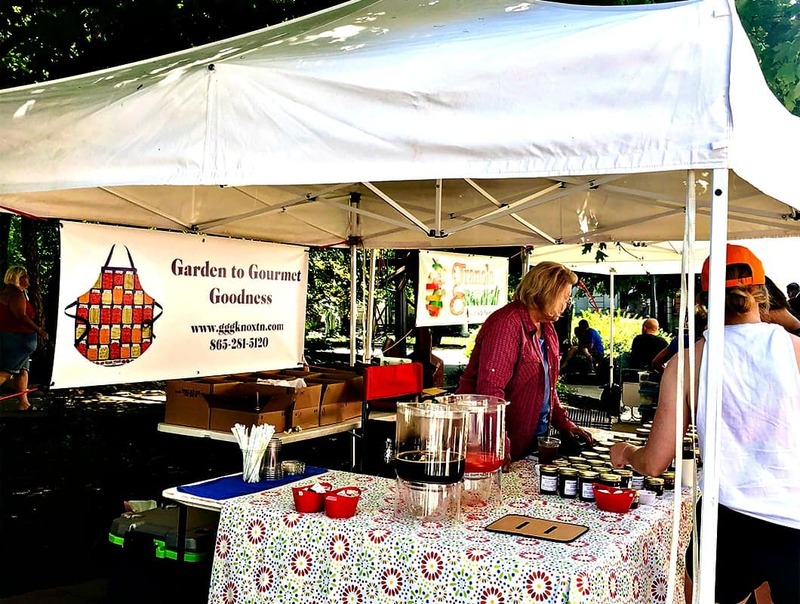 After tasting jams and jellies at the Garden to Gourmet Goodness booth at the Farmer’s Market a couple of weeks ago, I remembered a recipe I’d marked in my Fresh Market Cookbook a while back and knew exactly what I wanted to do with the jelly I brought home. 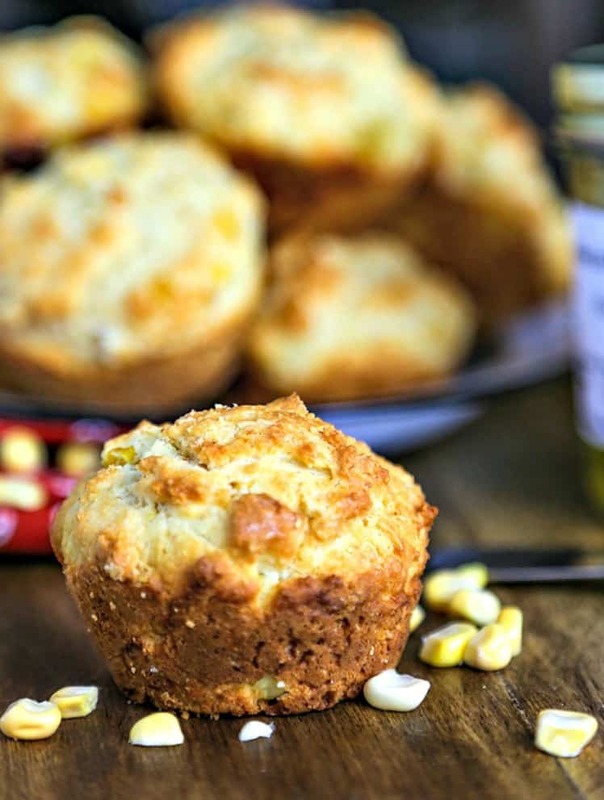 The batter for these muffins has a cup and a half of fresh cut-off corn, so there’s a taste of sweet corn in every bite. 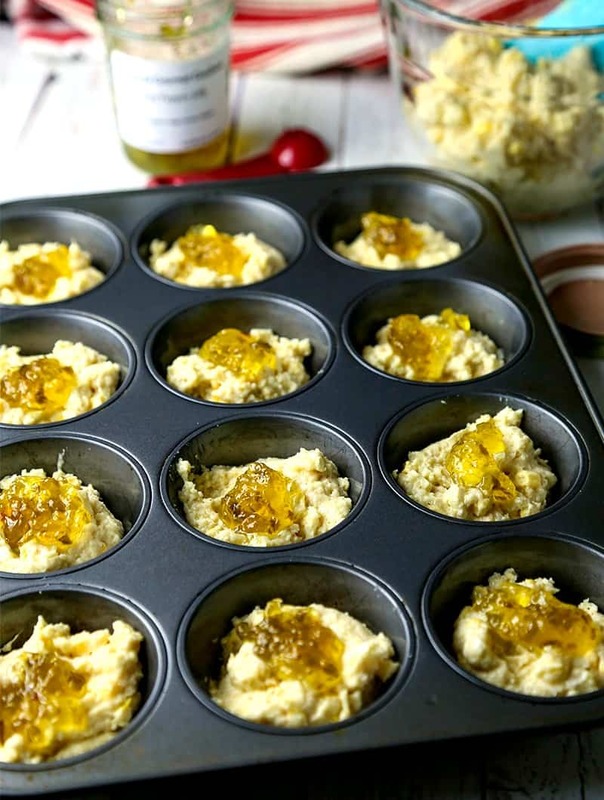 To assemble these muffins for baking, fill each muffin tin about a third full with the batter (see directions in the recipe below) and then add a teaspoon of the jelly on top of the batter in each cup. Spoon the remaining batter over the jam and cover it completely before popping the pan into the over to bake. The jam in the center is hidden and so that it is a spicy sweet surprise when someone takes a bite! On the outside, these muffins look pretty much like an ordinary corn muffin. They bake up golden brown and have a nice crispy crust and until you take a bite, there’s no hint of the surprise in the center! These muffins make a great accompaniment to soups or stews or if baked in mini-muffin tins would also be tasty as an appetizer for football parties. Don’t forget, you can find more new muffin recipes this week over at A Joyfully Mad Kitchen. Be sure to check it out! 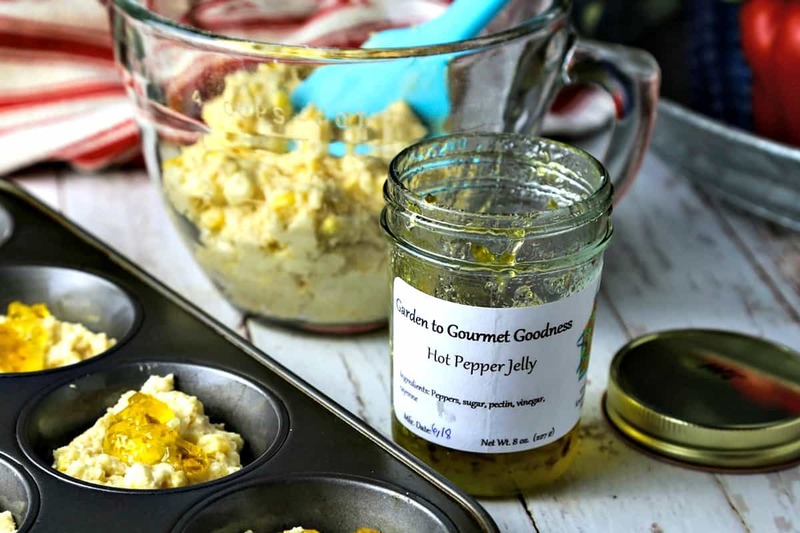 DID YOU MAKE THIS JALAPEÑO JAM CORN MUFFINS RECIPE? And, if you’re into sharing photos of your cooking adventures, please tag @lifeloveandgoodfood on Instagram and hashtag it #lifeloveandgoodfood. Happy baking, friends! A sticky-sweet—and slightly spicy—surprise in the middle of these Jalapeño Jam Corn Muffin will awaken your taste buds. 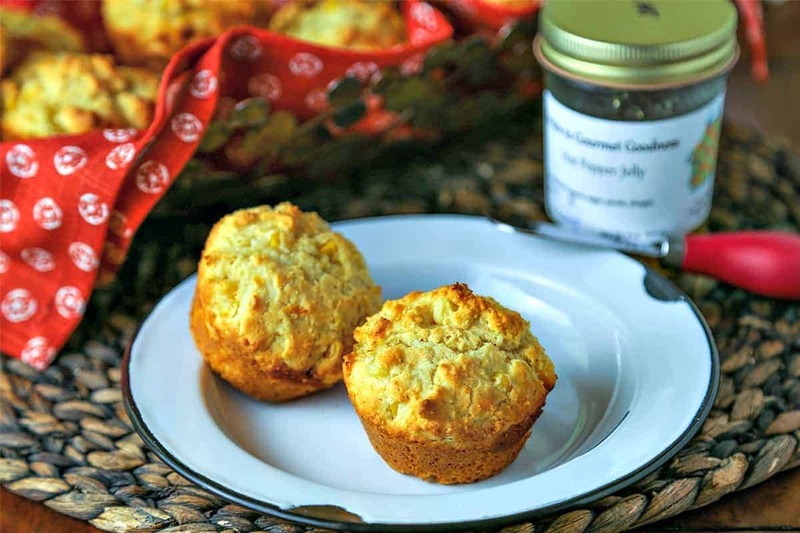 Just one taste and you’ll know this is not just any ordinary cornbread muffin! Preheat over to 375 degrees. Lightly coat a 12-cup muffin tin with cooking spray; set aside. In a medium size bowl, sift together the flour, cornmeal, baking powder, salt, and cayenne pepper. In a larger bowl, blend together the buttermilk, butter, and sugar. Mix in the eggs and blend well. Stir in the corn kernels. To this mixture, add the flour mixture and stir until just incorporated. Using half the batter, fill each muffin tin about 1/3 full. Drop 1 teaspoon jalapeno jelly on top of the batter in each cup, then top with the remaining batter being sure to cover the jelly completely. Bake for 22-24 minutes or until a dark golden brown. Serve warm. For mini muffins: Reduce the cooking time to 18 minutes. NOTE: Original recipe published in The Fresh Market Cookbook. These corn muffins definitely bake up nice and golden brown! And I love that jalapeño jam surprise in the middle! What a great addition to the recipe! Thank you, Leanne! The jam certainly makes this muffin special!